It may surprise you to read (or not, if you’re family) that I have squirrels in my closets. They nest in bins, and hide under papers, books, or textiles when I want to find one, or shout for attention when I don’t. But I like living indoors without wildlife, so these are not the red or gray, bushy-tailed squirrels, but the genealogical kind described by Meaghan E.H. Siekman in her essay “Chasing a Squirrel.” Where some researchers find squirrels in various other repositories, I usually need only to look in the next closet! These squirrels are the distractions which coax me off the straight and narrow to the lateral options of research. It’s not such a bad thing, really. When it comes to the stories I always want to find, lateral thinking leads to more stories, and if I look more closely, I gain insight into the personalities, motivations, and perspectives of those whose lives give us ourselves. 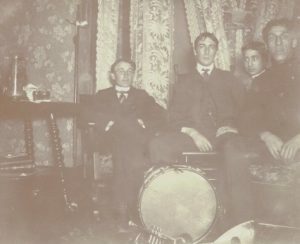 Rex, second from left, with some of the band, their music, and their drumsticks. 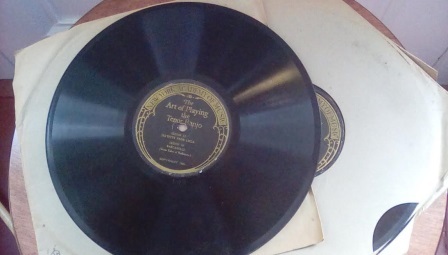 I was in for more surprises with the discovery of a series of heavy yet brittle 78 rpm banjo instruction records circa 1926. I vaguely remember a banjo at my grandfather’s house, one that we children played with as a toy, and I never heard anyone play it appropriately. In fact, my brother and I don’t remember music of any kind, live or radio, at my grandparents’ house. Where was the music? 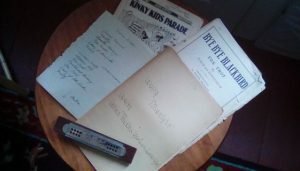 I found some sheet music, apparently for piano, trombone, and drums held down by an old harmonica. Wait . . . trombone? My mother played piano, my grandfather played drums, and my Dad played football. It was back to the bins where I found some handwritten music exams with detailed questions about the trombone, and signed by my uncle Cony Lee Church (1909–1927), Rex’s eldest son. Then Cony’s old trombone in its original case came to light from under the attic eaves, giving me fanciful mental images of 1920s “jam sessions” in my grandfather’s house. My father had apparently kept the instrument in memory of the older brother who had died too young. Cony, Ambrose, Rex, and friend. 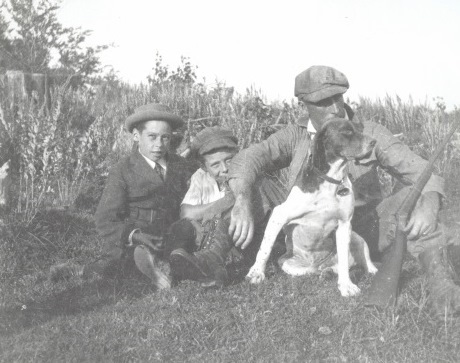 Genealogists will always tell beginning researchers to talk to family members while they’re still here to tell their stories. I took that advice before Dad died, and asked him about various times in his life. The trombone revived my memory of his emotional, cryptic description of bleak family life when his brother died. And that, I believe, gave me the answer to all these vestiges of the music so long absent from that house. Cony was the beloved first son, and his death at barely 17 years old from complications of scarlet fever was a blow my grandparents couldn’t handle and from which they never recovered. The day of his death was the day the music died. What a great story! My grandmother was a chorus girl in vaudeville shows. She came to live with us when I started school so my mother could go back to work. I have fond memories of her singing and doing a “soft shoe” dance around the kitchen while cooking dinner. My musical knowledge was definitely broaden because of her. This post brought back memories and old stories from both sides of my family. 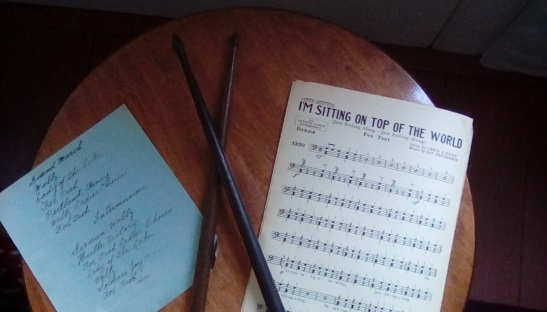 My dad played clarinet and alto sax in high school, and in college dance bands in the 1940’s. My maternal grandfather bought my grandmother a piano as newlyweds so she wouldn’t be lonely in their new home. All 5 of their children learned to play on that piano, and my sister and I also learned on the same piano. My mother’s eldest sister also played violin, and she taught piano and violin after retiring as a 4th grade teacher. My sister also played flute till she graduated high school. Thanks for bringing a smile and echoes of music and laughter from long ago! When I started to read this post I thought I’d reply by saying that I had actual squirrels living in my attic when I bought this old Vermont house, but I like your story better. My father was briefly in the chorus of the Philadelphia Opera Company before the Depression struck, and he played the French Horn. Yet my mother believed *she* was the musical one in the family. She did play records. What a lovely and poignant story! I learned a few instruments when young, encouraged by my mother. She always regretted not having or learning the piano. So in her early seventies she got one and had a grandchild give her lessons. She never got any good, but it meant the world to her to try.